Preheat the grill to medium. Cook the pasta according to pack instructions. Heat the milk in a frying pan until bubbling, add the salmon and a little seasoning, and cover with a lid. Cook gently for 6-7 minutes or until just cooked through. Using a slotted spoon, transfer to a plate and keep warm, reserving the milk in the pan. Pour the cheese sauce into the frying pan and add the capers. Cook gently, stirring until very hot. Drain the pasta and add to the pan. Flake the fish into the pan. Toss the ingredients together until combined then tip into a shallow, heatproof dish. Mix together the garlic, lemon zest and parsley, and add the breadcrumbs. 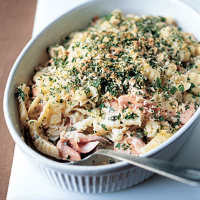 Scatter over the pasta bake and grill for 1-2 minutes until the breadcrumbs begin to colour. Serve with steamed green beans.